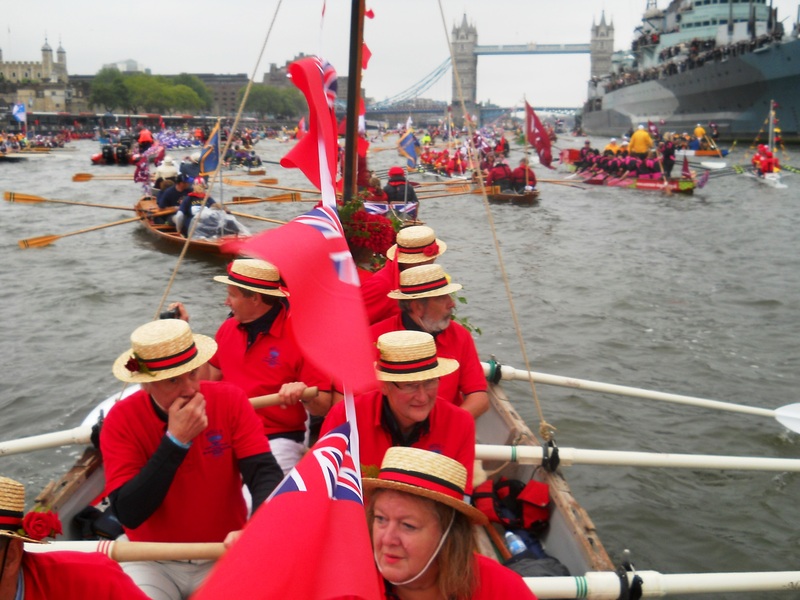 Molly's Perspective of The Most Momentous Maritime Mustering on The River Thames in over 300 years. Preliminary report - Whalers please feel free to send better, or additions. 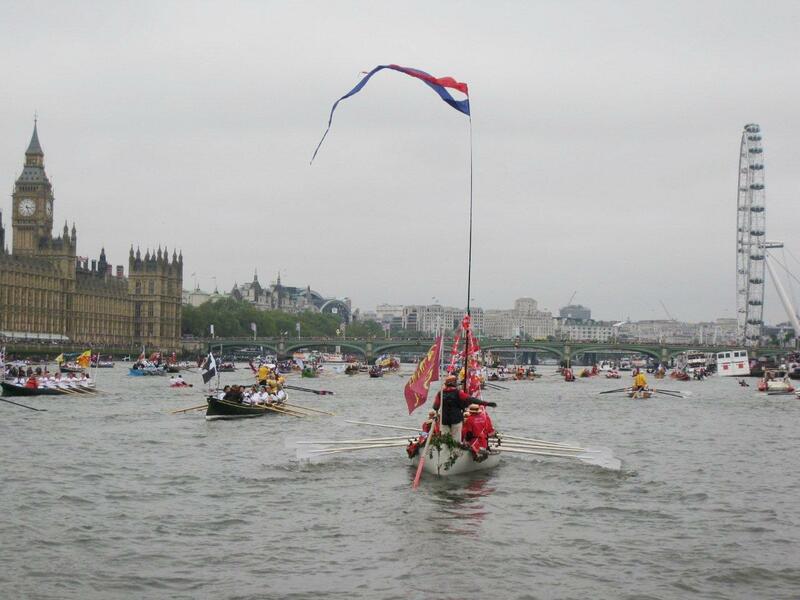 The Pageant Master had said "We expect at least one million people lining the route". He got them, in high spirits, cheerful voice, and happy to ignore the rain. Drizzle at dawn, and at Chiswick, somewhat set the scene meteorologically speaking, but brightening skies and British determination soon took over. Conditions remained relatively reasonable for much of the route. 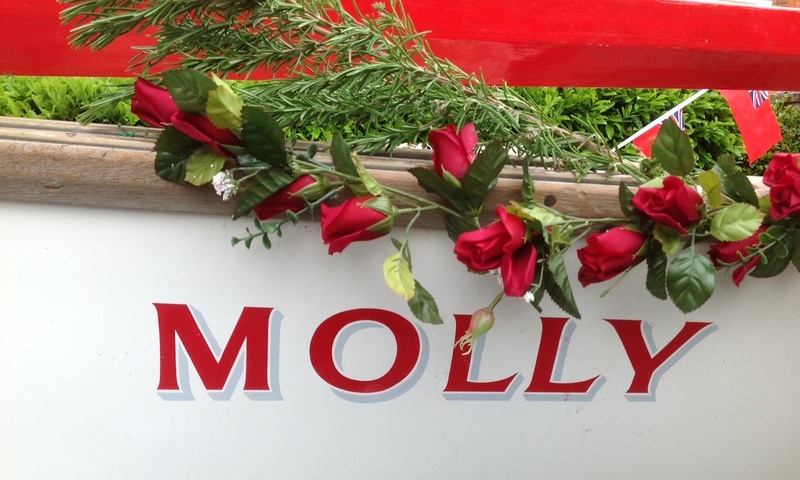 "Molly" was delivered to the beach at University of London Boat Club, Chiswick, at around 08:30, and her crew swiftly set to pumping out the overnight rain, and adding the decoration. 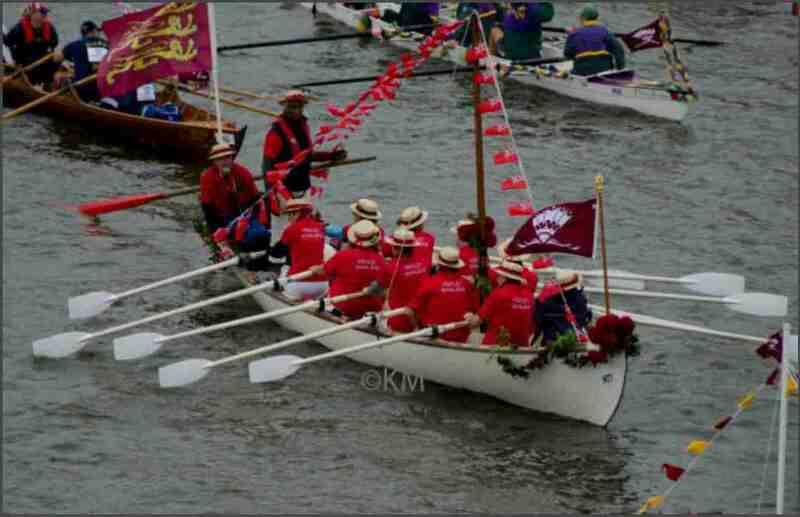 Scrutineering went smoothly, and the drizzle abated in time for group photos including the ten-oared salute. 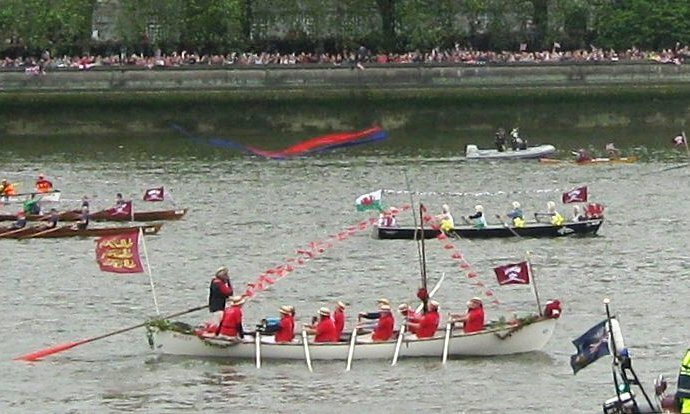 The (nautical) mile and a half to Hammersmith Bridge (the lowest on the tideway) was made to last an hour, so that Molly's section of the manpowered fleet would not pass through before 12:00. This was to allow motor vessels to take up their mustering moorings upstream of Putney. 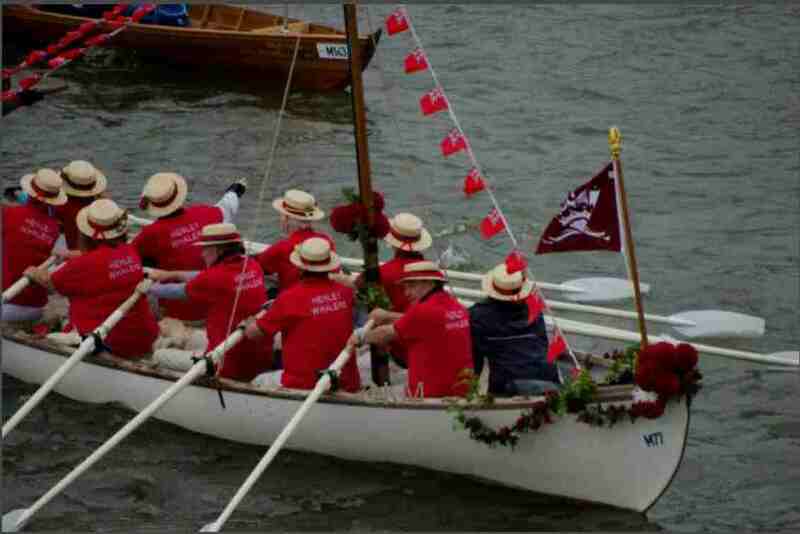 Access to the beach at Putney providentially permitted a "convenient" break in preparation for the forthcoming four hours of rowing. Molly was soon underway again and had picked up her mustering mooring, downstream of Wandsworth Bridge, in plenty of time for a relaxed "lunch break". Already, the crowds were thickly lining the banks and bridges. 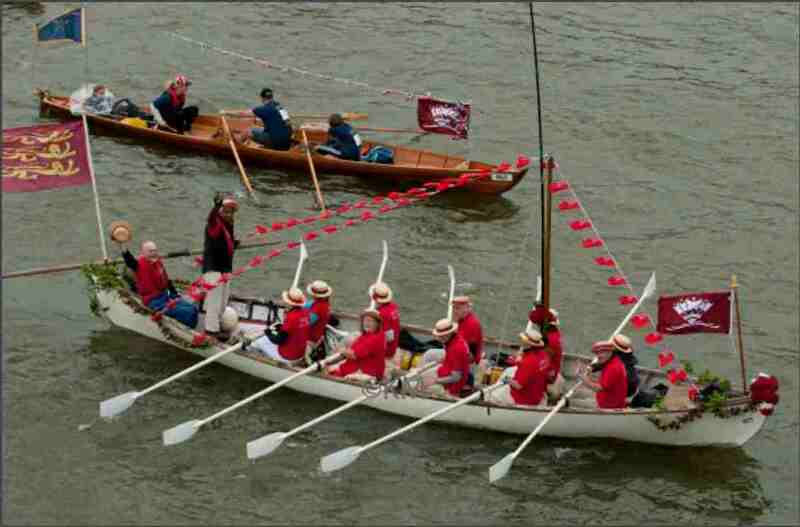 At 14:00 when the order "Prepare to row" was called, some crews (not Molly's of course) could not contain their enthusiasm, and set off without regard for the decorum of the designated formation. 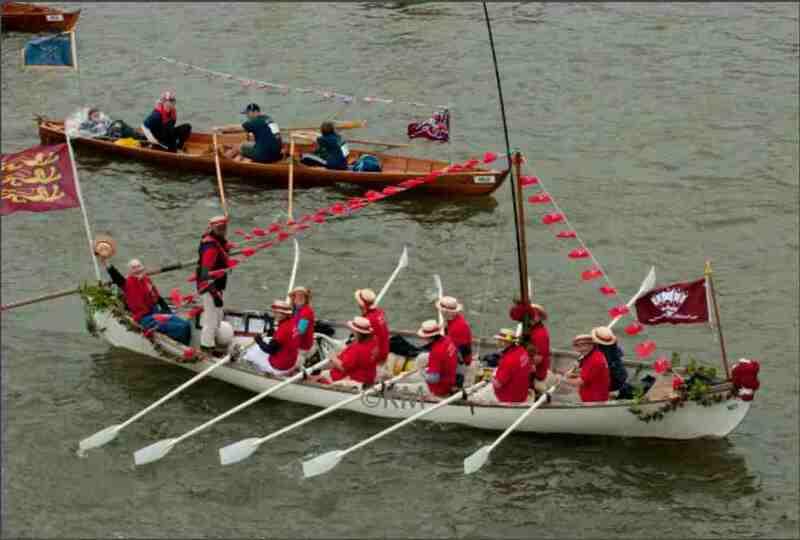 Even after Battersea Bridge there were only scant signs of the intended layout of boats. Molly's designated place, ninth from the front and third form the right became an impossible dream. Ah well, all the better to re-enact the scene captured in Canaletto’s masterpiece! 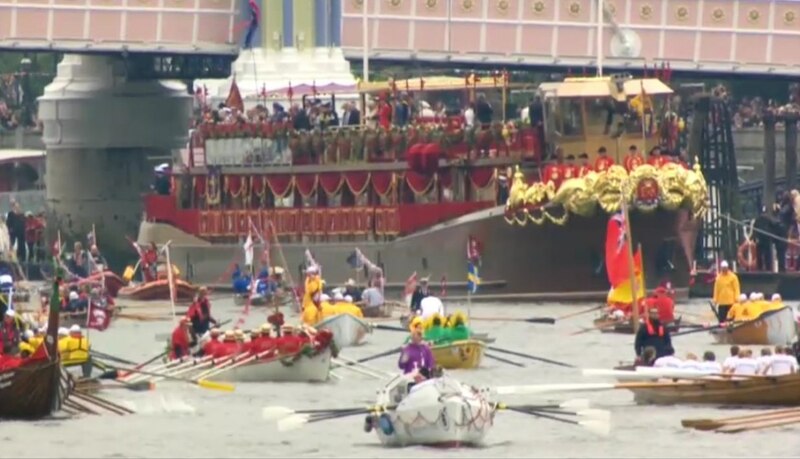 The timing of the Royal Salute (raised oars) succumbed to the same anarchy, though each boat executed it to their own version of perfection. 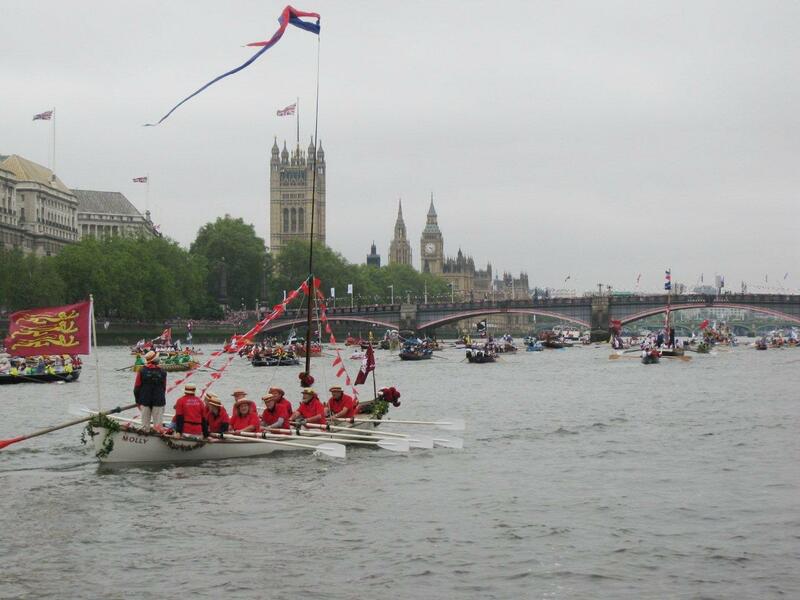 - "The best laid plans of the Pageant Master ..."
At Chelsea and Battersea the Jubilant crowds thickened to un-imagined numbers, and remained a constant feature throughout the route. Incredible! At times, the crush of manpowered boats was such that the convoy reduced to a crawl in order to fit though some bridges, for example. 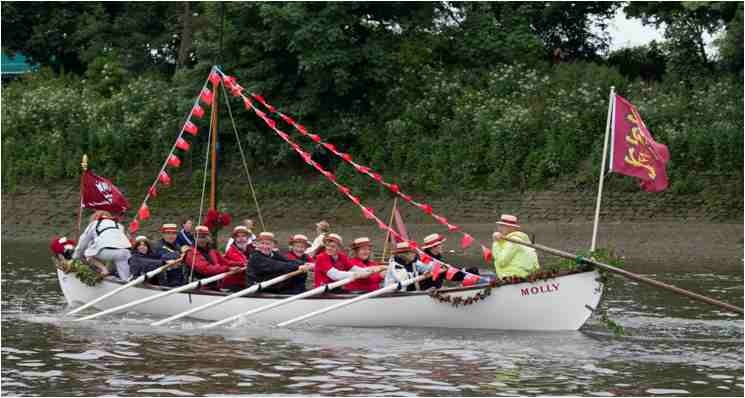 At each bridge, the height of Molly's mega-mast was skillfully adjusted to leave just enough clearance, in accordance with the calculated tidal heights. Somewhere downstream of Tower Bridge, the weather took a serious down-turn, but weather forecasts had prepared The Mollys for this - Uniform red tops had been put on over what might normally have been extra outer layers, a ploy which went some way toward protecting them from the worst of the cold and rain. Still cheered on by crowds on the banks, and up ranks of balconies, the final miles to Millwall Drawdock were completed at around 16:45. Nothing should be said about waiting ages, in cold rain, for small boats to be carried out of the water, nor of the undulations of the slipway preventing boat trailers from reaching the water, but praise must be given to the manhandlers wading up to their waists in water whilst manipulating heavy boats on to trolleys and up the ramp to their waiting trailers. - Heroic stuff - They should be mentioned in dispatches. Having to wait till 20:30 for a riverboat back, was less than ideal, but at least it gave shelter from the rain, and landed crew at Chiswick at 21:45. 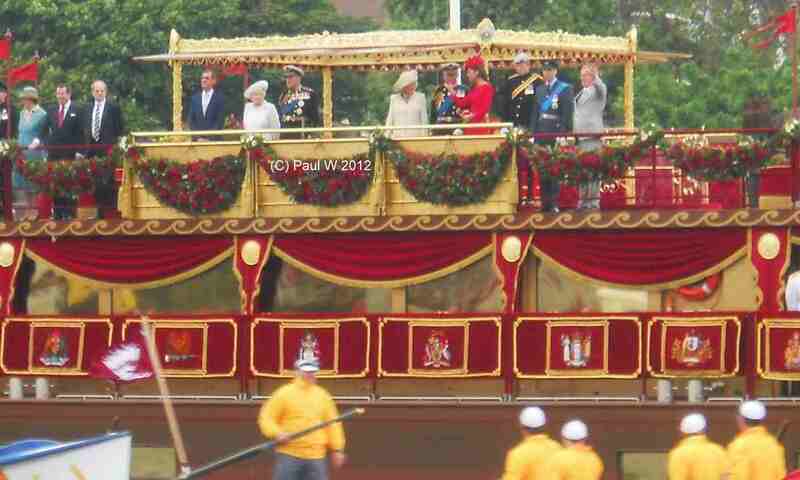 In summary, the unique occasion had exceeded all expectations - "Long live The Queen!" - When’s the next Jubilee? Saving the best till last - More lucid than the amateur effort above! Robin wrote an article for the local paper. Shame they have not yet/never published it! - Click here. Paul W - Album - Slide show . From UTube - Molly at 4:48 . >. .5:55. Sue's live interview on Radio Oxford. - Go to 1-59.55 for start of interview. Channel 4 - Molly at at 53 to 55 seconds . Sky News Any Sign of Molly? * Front cover, June 2012.